A sleep crisis has erupted throughout the nation. People are losing sleep and losing lives. The Slumber Corps has been created to combat the sleeplessness by having healthy dreamers donate sleep and pass it on to those in need. Trish Edgewater is a recruiter for the Slumber Corps. She is one of the best because the crisis is personal - her sister was one of the first to die from the lack of sleep. She is true to the cause and believes strongly in what she is working for . . . until she meets Baby A and is confronted by the nightmare epidemic created by Donor Y. 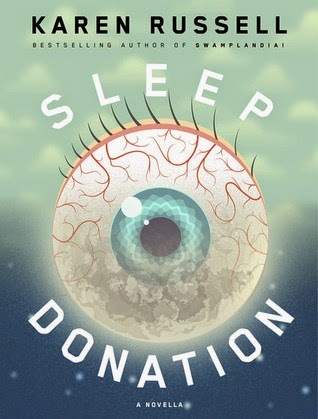 Sleep Donation is a novella, a quick read ... or, in my case, a quick listen. It is based off an intriguing idea of what happens when people do not get the sleep they need. And, the extent to which others will go to survive, to aid their loved ones, and to protect those in need. A glance into a world where one cannot or will not fall asleep makes one feel helpless and a bit depressed. But, there is hope. Just one hour of sleep can help to reverse the deadly sleep, or the lack thereof. The question that remains is ... Will there be enough to stop it all? Greta Gerwing narrates Russell's novella. At first, I had a difficult time adapting to her voice. However, by the end, she became Trish. She captured the tone of helplessness, the grit of loss, the voice of someone who is exhausted from the life she is living and the purpose she is trying to serve. In the end, Sleep Donation is a haunting tale. I know the feeling of nightmarish dreams and sleepless nights, and Russell captured it well. My only complaint is that I wanted more. I just wanted to know what happened next. Have you experienced the world without sleep? What were you left thinking and feeling? Ooo, I'm feeling exhausted just reading about it! I get so cranky and wretched when I skip a couple of hours of sleep. Jenny @ Reading the End ... Me too!! I LOVE my sleep!! I listened to this one too, I liked it but wish there would have been more to it. Sheila (Bookjourney) ... Me too! I kind of felt like I was left hanging! Until my daughter was about four, I slept maybe a total of 2 hours a day. I am not even joking. These days, just because of my busy schedule, I sleep about 4.5. Way under what a person is supposed to get. When I only got those two, I was in a state of medical emergency. Seriously. It was if I had had a stroke. The doctor said that I was a threat to lives around me and that he was going to hospitalize me just so I could sleep. It was a horrible experience but my daughter was soooooo needy and never slept. That is when my Lupus hit. I seriously think that triggered it. So... I forgot my point, that is why I am sure I can relate to this book. LOL. Ti ... Wow! I am not surprised that is when your Lupus was triggered. Stress can do it, and if you were only getting 2 hours of sleep a night, I would say that there was a bit of stress there. I'm glad to hear that you are sleeping more, but I also hope that it continues to increase. Too bad a sleep donation wasn't a real thing today, right?! ?